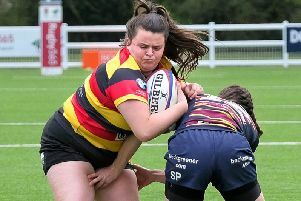 Harrogate survived the threat of a second-half comeback from Sale to earn a thirdwin on the trot in National Two North. 'Gate were dominant in the first half and took a 19-point lead into the break through tries from Callum Irvine, Alex Nesbitt and Sam Bottomley. Fifth-bottom Sale responded with two penalties from captain Liam McGovern early in the second period but 'Gate contained the pressure to maintain their upsurge in the table. However, the Aces were unable to add an extra point to their tally with the game's final play as they sought a winning bonus point. Harrogate had the better of the scrums pushing Sale backwards several times but Sale dominated the lineouts with their second rows taking Harrogate’s ball at least five times. Play was contained between the 20 metre lines for thirty minutes until Harrogate were awarded a penalty inside the Sale 22. They spurned the kick at goal and opted for the scrum from which the Harrogate number eight Willem Enslin picked up and drove for the line. When the ball was recycled fly half Irvine skipped through for the opening try, which Lewis Minikin converted. Four minutes later, Harrogate were on the try hunt again in the Sale 22 with Enslin, Jake Brady and Charley Purkiss-McEndoo leading the driving mauls. When the ball was released it was centre Alex Nesbitt who showed good pace to score the second try. Minikin’s attempted conversion hit the upright. Harrogate made it a comprehensive lead with the final play of the first half. Flanker Guy Coser kicked ahead and after flying winger Harry Barnard followed up, the ball was recycled for Irvine. The fly-half kicked into space and Sam Bottomley followed up to score close to the posts for Harrogate’s third try. This was Harrogate’s final score of the game but enough to be the winning score. Within two minutes of the restart after half time Harrogate were penalised in their own22 for a high tackle and Sale’s fly half Liam McGovern easily collected the three points. Five minutes later Sale were awarded a penalty 40 metres out and McGovern showed great composure to successfully kick the ball between the posts which proved to be the final score of the game. After ten minutes of the second half there was a free for all involving both packs of forwards and Sale’s prop, Kelly Joseph, received a yellow card for foul play. With five minutes of the game remaining Harrogate were awarded a penalty on the Sale 5 metre line and opted for another scrum instead of a certain kick at goal. Another try would have given Harrogate the try bonus point but the Sale scrum produced one last effort and pushed back the Harrogate eight. Harrogate: Lewis Minikin, Sam Bottomley, Noel Minikin, Alex Nesbitt, Harry Barnard, Callum Irvine, Danny Matthews, Charley Purkiss-McEndoo, Tom Larder, Connor Ward, Jake Brady (Captain), Andy Boyde, Jonny Coser, Guy Coser, Willem Enslin. Replacements: Steven Maycock(55), Nino Cutino, Tim Heaton(65), Tom White(54), James Audsley-Beck. Sale FC: Matthew Simpson, Jack Moorhouse, Chris Mayor, Tom Davenport, Ciaran Connolly, Liam McGovern (c), Sam Stelmaszek, Joe Kelly, Henry Platt, Nicholas Flynn, Rhys Davies, Ben Gledhill, Tom Ailes, Adam Aigbokhae, Jonathan Keep, Replacements: Jasper Mowatt, Jamie Frost, Matthew Postlethwaite(40), Connor Dever(40), Louis Singleton.